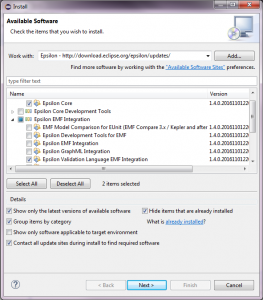 Download the Eclipse Modeling Tools package for your operating system from https://www.eclipse.org/downloads/packages/eclipse-modeling-tools/neon3. 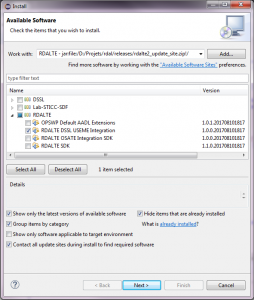 Unzip the package and run the Eclipse executable. Add the jUCMNav tool for use cases modeling from the jUCMNav update site at http://jucmnav.softwareengineering.ca/jucmnav/updatesite/. 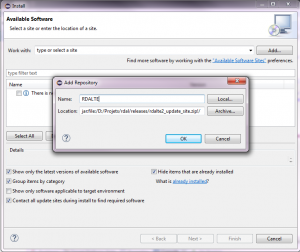 Then install the RDALTE extension for DSL development as shown in the figure below. Click next and follow the instructions to complete the installation. The Usability Software Engineering – Modeling Environment (USE-ME) is a model-based iterative approach supporting usability evaluation of Domain-Specific Languages. USE-ME can be combined with RDAL to extract the information required for usability evaluation from the RDAL models. Note that this integration is currently under development. Installing USE-ME first requires instaling the Epsilon EMF Validation tools. In order to do this, first add the Epsilon update site http://download.eclipse.org/epsilon/updates/ to the Eclipse update manager. Then select the Epsilon Core and Epsilon Validation Language EMF Integration tools as shown in the figure below. 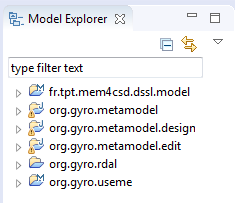 Example projects illustrating the approach for the develoment of a simplified version of the Gyro language to program Arduino robots are provided with the RDALTE DSSL USE-ME release. To install these projects, open menu File>>New>>Example. 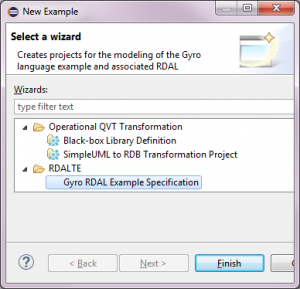 Select the Gyro RDAL Example Specification as shown in the figure below and click Finish.